EPFO again extends deadline for submitting Aadhaar: Contributors need to know The EPFO in January made it mandatory for its pensioners and subscribers to submit Aadhaar numbers. 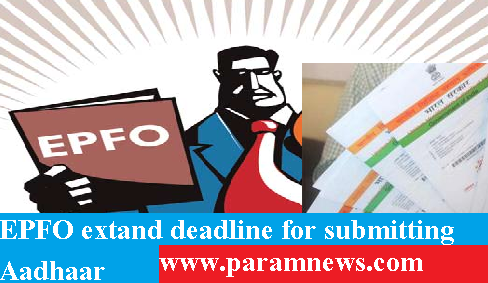 Retirement fund body EPFO has extended the deadline for submitting Aadhaar number to June 30 for its over four crore members. However, the deadline for submission of Aadhaar number would be September 30, 2017 in case of north-east states. "All field offices are directed to ensure that Aadhaar Number is furnished by the employer in respect of all new members who join the Employees Pension Scheme, 1995 with effect from July 1, 2017 except north east states where it would be applicable from October 1, 2017. The Employees’ Provident Fund Organisation (EPFO) had set April 30, 2017 as the deadline for submitting Aadhaar number earlier. The EPFO in January made it mandatory for its pensioners and subscribers to submit Aadhaar numbers. Later the deadline by revised time and again in view of slow progress over Aadhaar number submission by members. The central government contributes 1.16 percent of the basic wages as subsidy to every member Employees Pension Scheme Account in addition to 8.33 percent deposited by their employers every month. The Section 7 of the Act provides that where government provides subsidy, benefit or service from Consolidated Fund of India, an individual can be asked to undergo authentication, or furnish proof of possession of Aadhaar number.